There’s nothing like Merseyside hospitality, and this was proved after I gave two lodge talks over the weekend; the first to Dormer Lodge No. 6708 at Birkenhead Masonic Hall on Friday evening and Excelsior Lodge No. 3580 in Garston Masonic Hall on Saturday. Dormer and Excelsior are two vibrant lodges that meet in two excellent Masonic Halls that have some fascinating items on display that reflect the history of the local area, and both are well worth a visit. There are many Masonic treasures on display in both of these halls; in Birkenhead there is a beautiful rustic-looking Master’s chair that belongs to Mersey Lodge No. 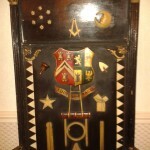 477 (founded in 1841), covered in hand painted and hand carved Masonic symbols. There is also a link to the Training Ship Conway that sank off Anglesey in 1953; the Conway spent some time on the Mersey, and it sank on the way to Birkenhead where it was about to be refitted. There is currently a Conway Lodge No. 4881 (founded in 1926 as a nautical lodge) that meets in Birkenhead. A painting of the Conway hangs in the dining room of the Masonic Hall. At Garston Masonic Hall just over the water in Liverpool, there are many items on display dating from the eighteenth and nineteenth centuries, most belonging to the Lodge of Harmony No. 220 (founded in 1796) that still meets at the Hall. I mention the Lodge of Harmony in my book The Liverpool Masonic Rebellion and the Wigan Grand Lodge as a lodge that didn’t join the rebellion, but was effected by the overall fallout. The lodge room itself has boards on display that record the Worshipful Masters of the Lodge of Harmony dating from the late eighteenth century. There is also a fine collection of Masonic glassware and earthenware on display from the nineteenth century.